Nadya Toto is the living embodiment of her designs: pretty, self-possessed and laced with refinement. With her F/W 2015 collection, she brings to the fore signature dress designs, handmade lace and elegant zipper-less ease. Nadya Toto is the living embodiment of her designs: pretty, self-possessed and laced with refinement. She is a full-time fashion designer with a wide-eyed young daughter to raise and still exudes quiet serenity. After a half hour chat, it dawns on me that Toto’s secret is to productively channel her stress. Toto is of the breed of creative working mothers and smiles when she speaks of 6 a.m. gym trips. Her unassuming ease comes through in her designs. Toto has released over 50 collections since launching her label 25 years ago. With her new F/W 2015 collection, she brings to the fore signature dress designs, handmade lace and elegant zipper-less ease. To scan her latest catalogue is to absorb an aesthetic of beauty without edges or angles. Toto’s dresses are for the effortlessly feminine woman with little need for excess. 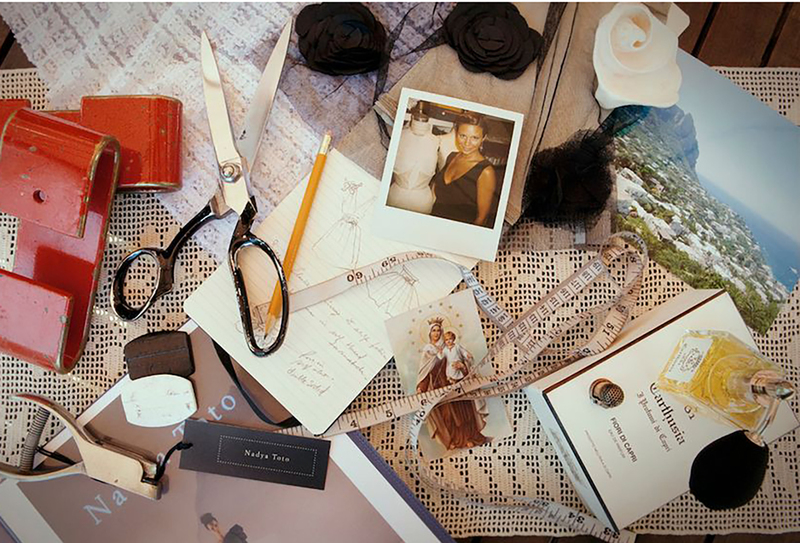 Descended from an Italian lace maker, Toto remains loyal to her creative European roots. She is a lifelong Montrealer who has been living and working in Beaconsfield for over a decade now. My conversation with her reveals she has a predictable fondness for swanky Italian restos and unwavering respect for pure and soulful designers. How would describe your own style? I wear black! And I’m behind the camera, backstage. Believe it or not when I have to go out, it’s like I’m blocked. Like my head is just not there. I guess I’m there to design for the rest of the world. Where do you shop for clothes in Montreal? Honestly I don’t shop much… Cabinet Éphémère is great to explore though. There was a selection made with a jury that chose the designers and the most beautiful thing about the concept is that it’s clothing that is all made here. If you look around you have the best of the best for everything. Like I didn’t know there were these designers like CANTIN doing these incredible bags. And shoe designer Anastasia Radevich. We have so much talent in Montreal, and it’s important to buy items made here. I had a lot of sales from tourists there. Because you know the tourists, when you go to a certain country you like to buy something from that country. Who’s your favourite Montreal designer? Interior designer Eva Mazur. First of all as a person I find she’s so down-to-earth and has a human touch. Because in design there are different kinds of people… She actually worked on my house so that’s how I know how she works, and she revamped a lot of houses in Westmount and downtown Montreal. Unbelievable transformations and beautiful work. She’s very pure and elegant in her design, she sort of believes in “less is more.” She also studied fashion so she has a sense of that too, everything has to do with upholstery. Of course, she has to respect the theme that the client gives her. My theme was “beach” because I just want to be at the beach! I think the challenge for an interior designer is that people have fundamental things that they don’t want to give away. As a designer it’s a challenge when the client has sentimental things, so she’s very good at incorporating those things from everyday life, like things that my great-grandmother gave to me. Which Montreal designer do you think deserves to be better known? Renata Morales! She is super talented. She’s a designer, but she has stopped doing fashion week in past years. But she has a lot of talent. She is a true artist, and not afraid to put her imagination into action. For me I wish I could hear her name a little bit more. What are your favourite places to eat and drink in Montreal? I’m not in Montreal as much anymore; it’s 12 years I’m in Beaconsfield. My favourite Italian restaurant is Bis on de la Montagne St. There’s ragù d’agnello, which is the ragu of—the vegans won’t like me anymore!—the ragu of lamb. It’s George Clooney’s favourite restaurant in Montreal. It’s just very good, and I’m difficult with Italian food. Also a great restaurant that I love is Le Richmond. It is co-owned by a Montreal fashion designer, Luc Laroche, who I admire very much. And I love the food and ambiance. I still love the old Whisky Café, on St-Laurent Blvd. It’s dark there and it’s relaxing and there’s good music and you get to drink your porto or whisky and it just has a nice ambiance. I’m more of a low-profile girl! What is it about Luc Laroche that you admire so much? We started together in fashion many years ago—he used to do underwear for men at Les Ailes de la Mode. He continued to do fashion and then I think he went to California and came back to open this restaurant-bar that he put his heart and soul into. Creating is like giving birth and it’s a new birth. For an artist, it’s not just about making a great collection, it can be about making this dream that he wanted to do. I congratulate him because I think it’s extraordinary. It takes a lot of strength and talent to do something like that and I know he put his heart and soul into it. Any local activities you would recommend for fellow parents? The Musée des beaux-arts is beautiful and really nice for kids. They have amazing activities! It was incredible actually, I visited the museum and you know what? I was just following and listening and they brought us to some incredible paintings. It was some Canadian artists and they actually explained to the kids how to make a painting — like a real painting — the dimensions, what comes first, the sky, the mountains… then after that they made them do a real painting. I was flabbergasted. I love to paint. I start my days early in the morning. I sometimes go to the 6 a.m. class and I do a lot of spinning at Gold’s Gym. And it just gives me so much energy to create and to work. I’m very spiritual but I’m not into yoga. Spinning, that’s my life! The late great Iona Monahan, a fashion journalist. She used to wear these big glasses and had her own powerful style. She really was an icon, my favourite actually. I feel like I grew up with her, because my parents used to read The Gazette and she wrote articles, and then when I did my first show she started writing about me. She was a different kind of journalist. I’d say it was about personal style. Her personality came through in her writing. The articles she chose to write were always very interesting, very good. She was part of that era and those important moments in the history of fashion. Also conductor Yannick Nézet-Séguin. I can’t talk about him or his work too much, but I like that he’s a young and a great conductor for our society in Montreal. He’s one of a kind and is also part of history. And very talented. You know you’re in Montreal when..
…when you see style. You know just by the way people dress. It’s a twist of European, maybe because of all the cultures. People take care of themselves too. They dress very well, they like fashion… I would say there’s more flair here!